Angel tattoos are not necessarily very common, so they can be a quite unique means of expressing oneself with their ink. Though they are commonly associated with positive imagery and religious conviction, they can mean the exact opposite at the same time. Angel tattoos, whether representing the classical picture of an angel, or that of a fallen angel, can prove to be interesting pieces that show a deep, spiritual side to the wearer. Angels are the servants of God in all religious texts that use the term, “angel.” They often carry messages from God to earth, bringing information to those chosen by God to receive such messages. As you can easily surmise from this short description, this directly links angels as being messengers for God or another higher power. Most angel tattoos carry the appearance of an adult man or woman, with large wings and often sporting a halo to imply their purity. 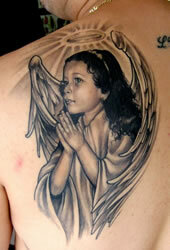 The common focus on meanings of angel tattoos seem to be as a messenger, whether cherubic or adult. They are most often used in commemorative or tribute tattoos to signify the death of a loved one, or can be shown holding a child, but can also represent divine protection and safety in a higher power. For the purpose of safety, some angel tattoos may be depicted as carrying a weapon, such as a sword, to signify a fight against evil, or fighting against any harm to come to the wearer of the tattoo. At any rate, whether aggressive or peaceful, angel tattoos seem to be, for the most part, joyful pieces that remind the wearer to stay pious and live their life for God. Though most angel tattoos depict adult figures, some may decide to use the imagery of a cherub, which is of a large, pudgy, glowing child often shown alongside religious events. There are, however, other angel tattoos that go against this thought, and images of fallen angels often appear, as well. © 2019 Miami Ink Tattoo Designs.